They were extremely helpful and flexible with my husband and I. We ran into an issue and the people at Keefe's worked with us no problem. They are all kind and joyful which made this experience so much better. I've included a picture of our wedding cake because they supplied the flowers for it. The flowers were all beautiful and pulled together perfectly! I was so impressed with the flowers created by the team at keefe's!! They delivered to the mountain and create exactly what I was looking for in flower pieces as well as bouquets!! 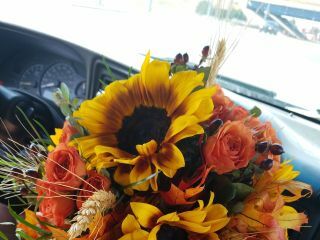 Keefe's did a fantastic job with the flowers for my wedding! 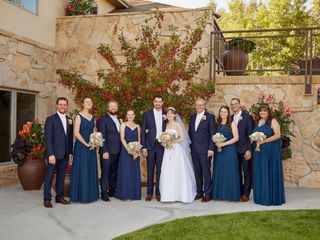 We had an outdoor wedding on a hot day in August and everything was perfect - the flowers lasted and did not wilt in the heat! Paige was seriously amazing to work with and was very flexible with our schedule considering we lived in another town. Paige took everything I wanted into consideration and made it perfect for our day while also keeping us under the budget we wanted! We chose to pick up our flowers and they were ready on time and in the jars that we had dropped off. We also rented the arch with aspen log pieces and it was easy to assemble and looked beautiful! Courtney, thank you for your feedback! We are so happy to hear your experience with us on your wedding day was so wonderful. It was such a pleasure to work with you to make your dreams come true! 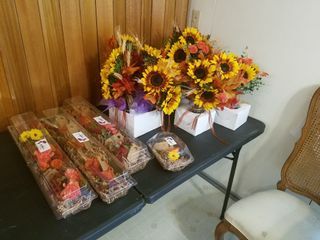 On the day of my wedding I had not set up delivery, and with one call they setup and delivered flowers to the church within the hour! Paige was a joy to consult with and their prices where way better than other options we considered! Thank you! Kaylin made my bridal bouquet and they couldn't have been more perfect. It was exactly wanted I wanted and was more perfect than I had imagined. Thank you Kaylin!!! Everything looked great and was done exactly how I asked! Paige was a delight to work with and very professional. I asked her to have fun with the arrangement after I told her the colors and she suggested a few flowers. 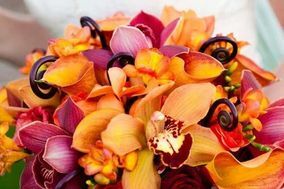 The colors blended perfectly and everyone complimented on how beautiful the flowers were. We literally signed up for Wedding Wire just to review Keefe's Flowers. Melanie and Paige are ahhh-mazing AMAZING people. We walked into their shop with our wedding a little over 30 days away. They understood our vision immediately, never once trying to up-sell us or change our minds. They stayed EXACTLY on budget and NEVER sacrificed quality to do so (not a penny over!!). 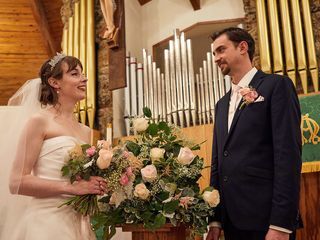 They kept us informed of their progress at every step, providing sample arrangements at the outset and insisting we come by in the days leading up to the wedding to see the flowers blooming and bouquets & arrangements taking shape. Every single flower was fresh and fragrant and absolutely GORGEOUS!!! They even went ABOVE & BEYOND for us with every ridiculous curve-ball we could've thrown at them: accepting a delivery of flowers from out of town; coming up with cost-effective ideas for the head table arrangements; handling last minute requests from our caterers; etc. 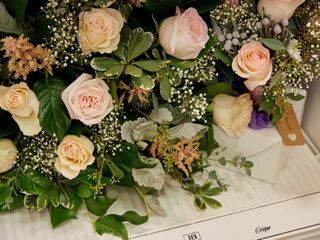 Most couples spend months, even years working with their florist, but in only a few short weeks, we got to know and LOVE Paige. They genuinely care about their work, but more importantly they really do care about their customers. Better than any service any amount of money can buy---in Casper or anywhere else! Paige made our wedding day simply AMAZING, unlike anything we could have ever imagined and more than we could have ever asked for. We will DEFINITELY use them again and are recommending them to everyone we know!!!! Keefe's was great to work with, and our flowers were stunning. We were planning long-distance and the owner (Melanie) met with us several times through the process. Her prices were awesome and the flowers were gorgeous. 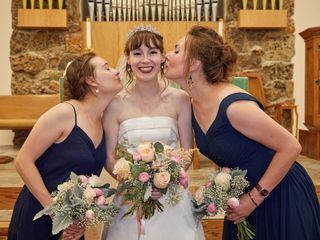 Plus, she was willing to let us pick up our flowers on morning of the wedding day (Sunday), even though the shop was closed! Sarah and the ladies at Keefe's were more than accommodating when we had to change the date of our wedding. 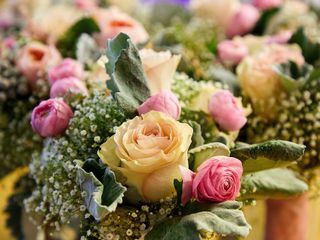 They went above and beyond in helping us through several obstacles to find new flowers similar to our original selections when their vendor told us they were out of season and guided us perfectly. I had zero reservations trusting the professional opinion of Sarah in guiding us through arrangements and color combinations etc. Completely phenomenal experience. My biggest desire was that our flowers really stood out as unique and exciting and Keefe's delivered. Sarah even came and set up the arrangements and the church and the reception venue no questions asked and just made it so hassle free. If I could give 100 stars I would. I was originally shocked by the price but it was well worth it!